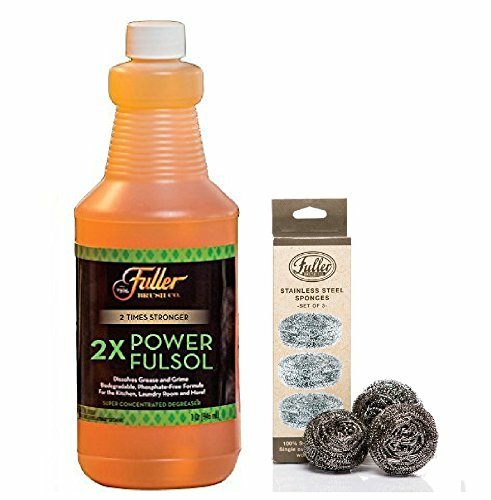 Fuller Brush Fulsol 2X Power Degreaser Kit with Stainless Steel Sponges by Fuller Brush at Natural Green Cleaners. MPN: unknown. Hurry! Limited time offer. Offer valid only while supplies last. Fuller Brush Fulsol 2X Power Degreaser - Dissolves grease and grime. Biodegradable, Phosphate-free formula. For the Kitchen, Laundry Room and more! Fuller Brush Fulsol 2X Power Degreaser - Dissolves grease and grime. Biodegradable, Phosphate-free formula. For the Kitchen, Laundry Room and more! Super concentrated degreaser. Fuller Stainless Steel Sponges - Over 600 feet of stainless steel in the palm of your hand! Our rust resistant sponge is actually over 8,000 inches of continuous stainless steel coiled 40,000 times for increased flexibility and cleaning power. Outlasts steel wool. Box of 3. Made in USA. FULLER 2X DEGRESER: Dissolves grease and grime. For the Kitchen, Laundry Room and more! Super concentrated degreaser. FULLER SPONGES: Over 600 feet of stainless steel. If you have any questions about this product by Fuller Brush, contact us by completing and submitting the form below. If you are looking for a specif part number, please include it with your message.